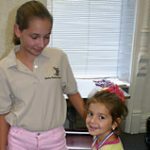 On September 11, 2006, team members from McGuire’s joined a host of other audiology professionals during a “Lift Up America” Mission in Brooklyn. 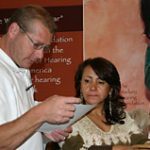 During that day, hundreds of people – who might not have otherwise afforded new devices – received hearing instruments for free through the Starkey Hearing Foundation’s “So The World May Hear” program. 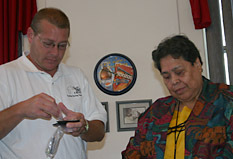 David Carr, President of McGuire’s, prepares to examine and fit a hearing device recipient. 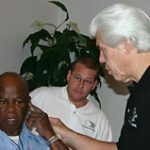 Starkey founder Bill Austin speaks with a patient (seated) as McGuires’ owner David Carr look on. 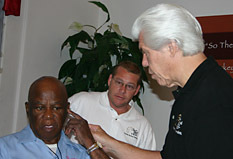 David Carr helps a patient get ready for better hearing. 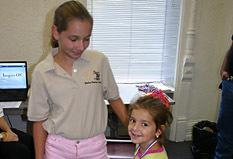 Krysta Carr, daughter of McGuire’s owner David, entertains a younger patient. 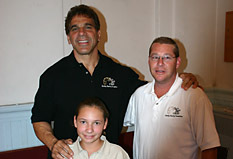 Bodybuilding champion and actor Lou Ferrigno pals around with Krysta and David Carr. 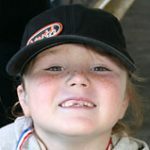 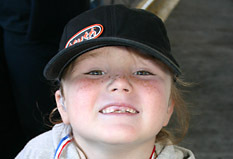 A young patient smiles for the camera after receiving her device. 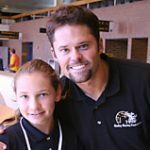 Krysta Carr poses with Justin Osmond, of the famous singing clan.